In 1946, a young orphan from Poland arrives at a New York yeshiva where he will study and live. Narrated by a stuttering boy named Aaron, this is the story of young Daniel, whose parents died in the Holocaust. Daniel is an extremely quiet boy who constantly clutches a tin box, the contents of which remain a noteworthy secret, and who becomes a topic of great interest to the yeshiva boys. Aaron, dubbed “Gravel Mouth” because he stutters, has a huge heart. Daniel knows nothing of America; yet he desperately needs a good friend. Aaron, the stutterer, has a heart of gold, but he is bullied by the other students. The connection is instantaneous. Daniel is handicapped because he speaks almost no English. Aaron speaks English, but his stuttering is a similar handicap. Together, they face an uncertain life and discrimination. 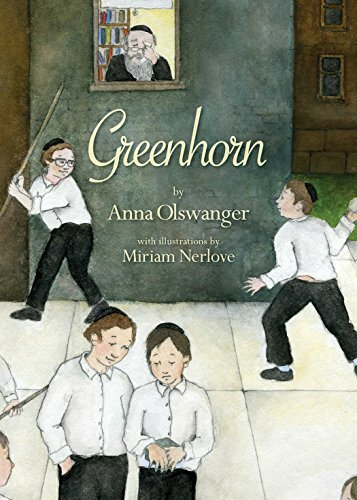 Anna Olswanger (Shlemiel Crooks, 2005) has crafted a marvelous Holocaust book for youth. She carefully introduces the Shoah in a poignant and dramatic manner, without revealing the shocking violence and brutality inflicted by Nazis upon the innocent Jewish families of Europe. Instead, Greenhorn produces a sense of boyhood camaraderie within the encroaching shadow of the Holocaust. Instances of the terrifying violence and cruelty of the Holocaust are explored within the statements of Daniel’s yeshiva companions. Here, Ms. Olswanger opens the door to a childlike exploration of the Holocaust between the child reader and a responsible adult. The mystery of the tin box in the unrelenting hands of Daniel drives this fascinating story. The box is little more than a curiosity to the yeshiva boys. But to Daniel it means everything. It is the only physical connection to his lost loved ones and a life increasingly distant. The contents of the tin box represent the unbound terror of Nazi genocide. This is humanity’s darkest point in history. It is frightful beyond imagination. Yet it equally serves as a powerful metaphor. While we can hold onto potent memories of lost love, we must bury the physical artifacts that prevent us from moving past the genocide and into a new life filled with wonder and potential. Familiarity between Aaron and Daniel evolves as Aaron’s ubiquitous invitations to a close friendship gradually chip away the veneer of Daniel’s frosty countenance. Everyone requires a special friend, someone that she or he can use as a sounding board for special memories and enticing new concepts, a person whose amity will never falter. This is a book that families can share with children when it is time to introduce the concept of the Shoah. Although the tale exists in a yeshiva with Jewish concepts and values, any family can comprehend losing loved ones as a child—as well as the powerful healing value of friendship. Ms. Olswanger is to be commended for careful attention to detail required by any historical work. The idiosyncrasies of colloquial American English of the period are reflected in the vernacular of the boy’s verbal communication. The dialect of this communication is entirely appropriate, if not also creative. This book is enhanced even farther with the addition of many excellent illustrations, each one reflecting the environment, participants, the box, the boys’ clothing and the emotional affect of the situation. Thankfully, few of us will ever be in a position of losing all of our loved ones to genocide. Hopefully, humanity will grow beyond the realm of mass murder based upon intolerance. Greenhorn proffers a child’s perception of having his parents and family stripped away at a tender young age. Here we find a perfect launching point for a discussion of the Holocaust aimed at youthful learners. Alone in the world, poor Daniel clutches to the only artifacts of his parents in a tin box. Driven by abject fear and horrific personal loss, Daniel can only be saved by the tender mercy shown to him by a young yeshiva boy in New York. In this compelling symbiotic relationship, Aaron and Daniel heal each other. Update: In 2014, author Anna Olswanger and director Tom Whitus co-produced an indie film adaptation of Greenhorn. The film premiered at the Landmark NuArt Theatre in L.A. and at The Museum of Tolerance in New York. It was named the 2015 Audience Award Winner for Best Short Film Drama at the Morris and Mollye Fogelman International Jewish Film Festival in Memphis, and subsequently aired on public television. In 2006 it was part of the Festival Internacional De Cine Judio en Mexico and the International Children’s Film Festival at L.A.’s WonderCon.